In the last issue we noted that a growing Sydney was growing up as well as out. We highlighted some of the developments that were in the pipeline from the Block to Barangaroo, from Green Square to Ashmore. With the Randwick and Anzac Parade Urban Activation precincts expanding and the Westconnex and Central to Eveleigh announcements, it has become apparent that such developments are just the start and that there is much more to come. While communities focused on the new NSW planning system, the new Regional Plan for Sydney in the form of a Draft Metro Strategy was exhibited with none of the promised ground breaking community engagement. Yet this strategy is already being used to justify development announcements. This issue in The Shapers of Things to Come we look at how its “City Shapers” will change the face of the inner city and in The Pyrmont and Ultimo Experience we see what we can learn from the high rise development of Pyrmont Ultimo. With the new planning system promising much improved community engagement there is the opportunity for the community to push the consultation envelope to achieve significant improvement. Three articles unpack some of the consultation issues, Dallas Rogers in The Real Stuff of Community Engagement looks at how consultation spaces are controlled and how communities can respond through monitory mechanisms while Roberta Ryan in Engaging with Communities: Something’s Not Right explores what is needed on the government and proponent side to improve the process. In Lift Redfern: The Art of Conversation we have also explored some of the lessons from the Lift Redfern Station Campaign and sketched out the proposed Community Participation Charter from the new planning bill in A New Planning Approach. The latter highlights what communities should expect for any future consultations with government in NSW. The finding by the Auditor General that Public Housing is in decline and comments from the Departmental Head end an era of public denial. The reality is spelt out in two comments by Michael Coutts-Trotter when he says “in fact, the portfolio has been depleting at an average of 2.5 properties a day for a decade” and that “there’s one big lever to pull – the potential to more actively redevelop higher value land under the portfolio to provide ongoing returns to reinvest in social housing”. It is in this context that the sale of public housing needs to be understood and in Caught Between the Rocks and a Hard Place you will find some of the arguments being used to try and save public housing in Millers Point. Our HACC Development Officer, Enis Jusufspahic, explores the NDIS and its introduction into the Hunter in NSW Disability Reform: In Context and we also explore local government statistical information that is helpful in funding applications and reports in Statistics: Keeping Up with Change. From the Vault this issue goes back to an Inner Voice article about the Film Waterloo from Summer 1981 and includes a review which finds it is still relevant today. 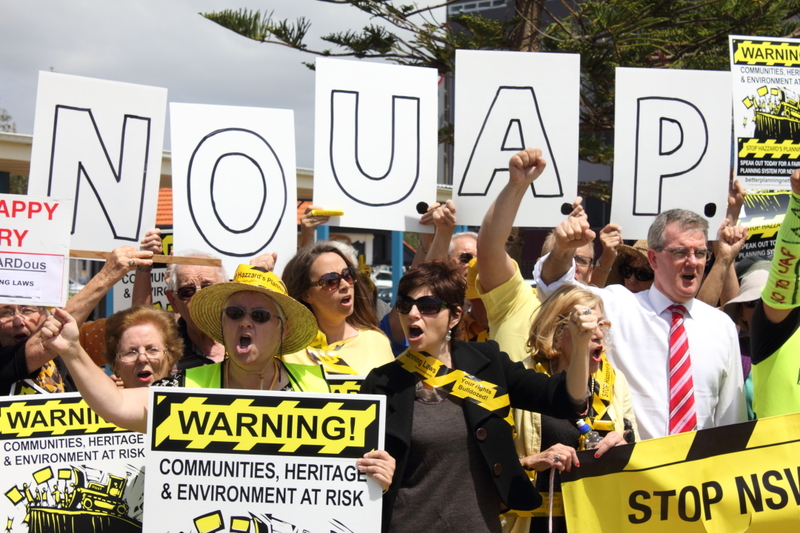 Anzac Parade South Urban Activation Precinct protest – more will follow if best practice community engagement in strategic planning is not implemented.